March 11. Daylight savings time has passed. Another cold and dreary day in Grand Rapids but despite the weather, I have hope! Hope that spring will be here soon. Hope that if I keep putting one foot in front of the other I will trudge to happy destiny. On days like today, I love being able to turn my attention to cooking. Cooking is the ultimate form of creativity for me. It calms my mind and turns a bright light on inside of me. I get so excited to see how things will turn out but the process is, in an of itself, often enough for me. Today happened to be Food Matters Project Monday. 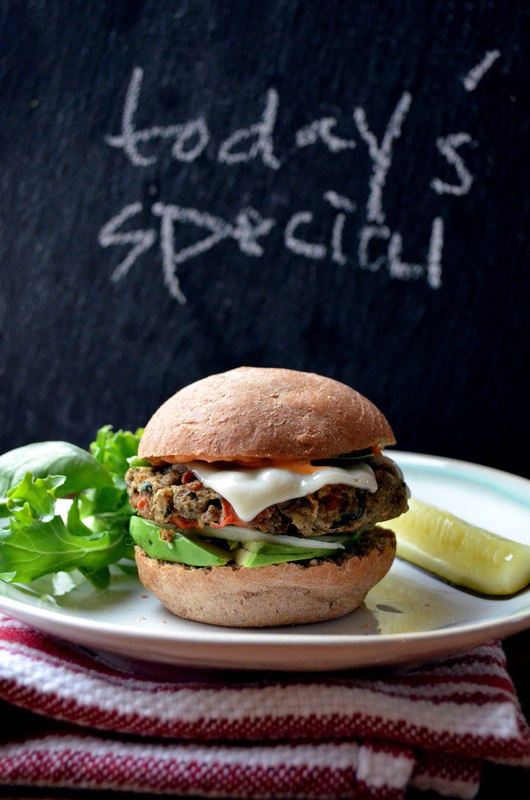 Evi and Sam from Fifth Floor Kitchen chose the recipe for us this week…brown rice and lamb burgers with spinach. As you know, I’m not a huge fan of cooking with meat so I opted to make lentil and brown rice burgers with lots of veggies. I already had a pot of lentils cooked up for who-knows-what-I-would-want-to-do-with-them. I always have a use for lentils and have a deep fondness for them. I also happened to have cooked brown rice on hand, having cooked it for quick weekend meals. Score! Next came the bit where I decided how I wanted to flavor these bad boys. I sautéed diced onions, celery, mushrooms, scallions, garlic, a couple of leaves of shredded collard greens, and some fresh parsley with some olive oil and salt. When they were cooked up I tossed in a handful of sunflower seeds for crunch. Next, I blended some lentils with some rice and two eggs in my Breville blender (you may need to use a food processor if you don’t have a heavy-duty blender). After that, I mixed the lentil-rice-egg mixture with the vegetables, stirred in some miso paste for flavor and some brown rice flour for texture and holding power. 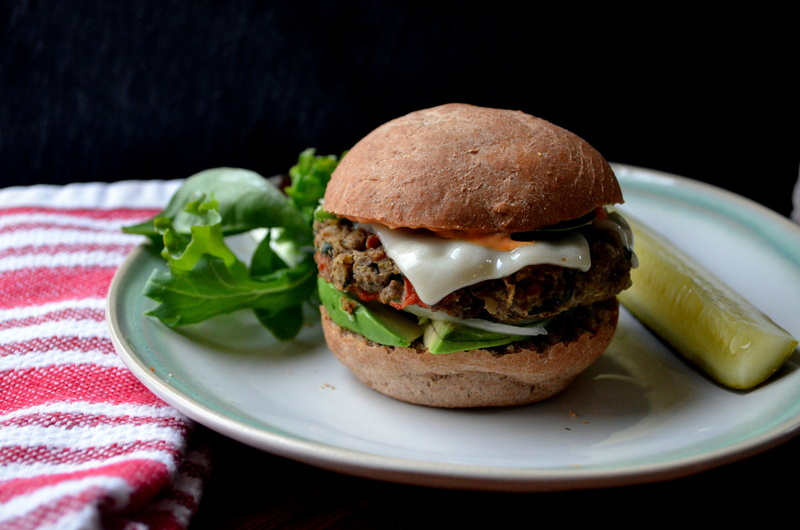 The result was a flavorful, healthy patty with just the right texture and really nice umami flavors. 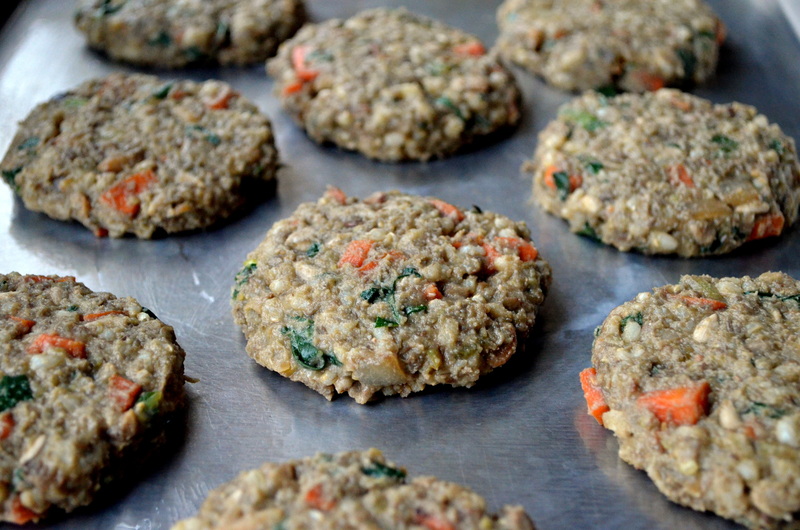 This recipe made about 15 small patties (I’m trying to remember how many I ate and how many I started with….hmmmm). I made them small because my buns were small but you can make these any size you want. I experimented with baking vs. pan-cooking and I found that cooking these in the pan were easier because they stuck to the baking sheet for me a little bit. Next time, if I chose to bake them, I would use my silicone baking liner and that method would work out just fine. These measurements are not exact…and you can add the seasonings you want if you don’t have some of the things I added. No biggie. Just make sure you can form these into patties and that they hold together and you are good to go! I served mine on a wheat bun with sliced avocado, thinly sliced onion, swiss cheese, and homemade sriracha mayo. I cannot WAIT to post about the sriracha. I am highly recommending you all try to make it at home–it’s easy and delicious and tastes even better than the store-bought kind. To see what the other creative takes the Food Matters Project cooks came up with, head over to the website. 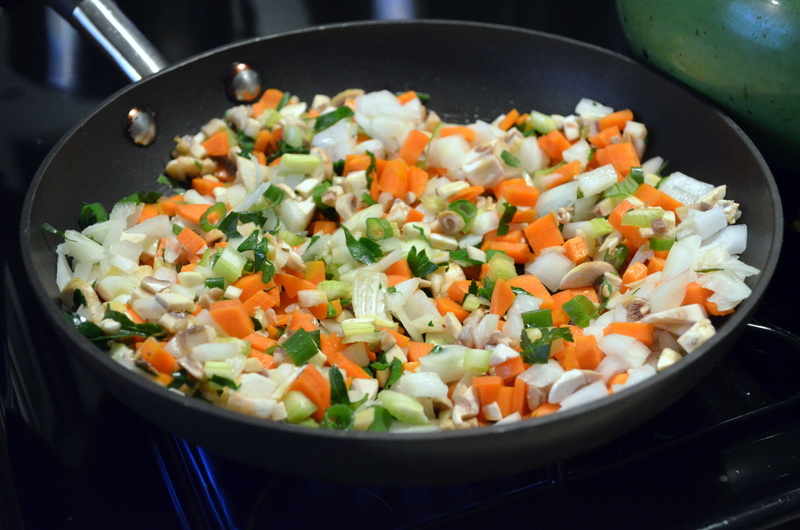 Heat olive oil in a pan and add all of the ingredients through parsley. Saute for about 5-7 minutes on medium heat, stirring frequently. When vegetables soften, turn off heat and add sunflower seeds. Transfer to large bowl. Put lentils, 1 cup rice, 2 eggs, salt, and miso paste into a blender or food processor and pulse until combined. Pour lentil-rice-egg mixture onto the vegetable mixture along with the remaining 1/4 cup of rice and combine thoroughly. Add flour until the mixture is thick enough to form into patties that hold their shape. Heat one teaspoon oil in a non-stick skillet and add patties to the pan, cooking in batches on low heat until the patties are browned lightly on the bottom, about 5-7 minutes. Flip and cook on the other side for about 5 minutes until browned. Transfer to a plate and cook the rest of the patties in batches. Serve on a bun with any toppings you would like! 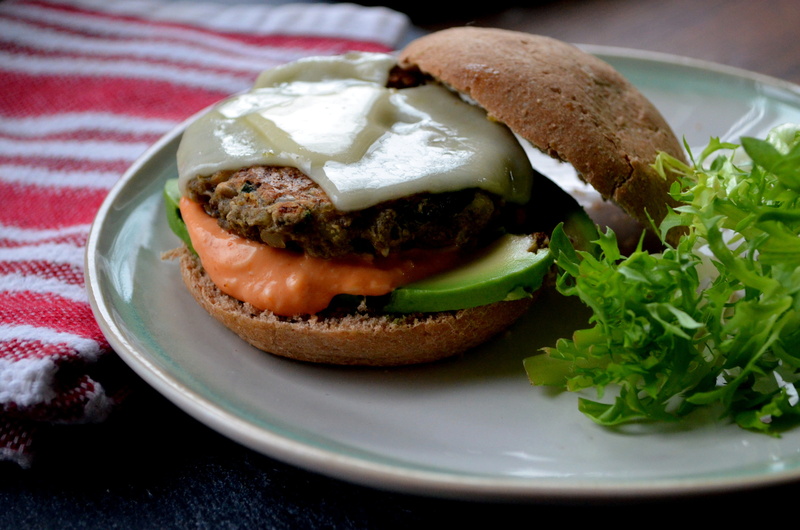 I love avocado, lettuce, onion, dijon mustard, sriracha mayo, cheeses….mmmmm….I think I might have another! These look fantastic!!! I love that you were able to put so many flavors together…and they look very gourmet. Wish more restaurants would have this as an option! Glad you enjoyed the idea and took it to suit what you had/prefer! Love your burger Aura BUT I am holding my breath for your home made sriracha! Sounds great – I wouldn’t even miss the meat (although lamb is also a big favourite of mine 🙂 ), and look, you even managed to bring together a pan-ful of spring over there! I just made these and went to put stuff away and realized I had 1/4 cup of rice left over (*divided)! Did I miss something? Good catch! I’ll update the recipe right now. I pulsed 1 cup of the rice and then added the other 1/4 of the rice when I mixed with the veggies for added texture. I’ll update the recipe right now. The great thing about this recipe is that it allows for so much flexibility 🙂 I hope yours turned out great!